Preventis System does not limit its services to simple paper handling of your Safety Data Sheets (SDS). We beleive in true risk management that covers areas such as approval/acquisition, PPE selection, handling, storage and disposal of hazardous materials whether they are introduced by your employees or external contractors. Our strategy complies with the Regulations respecting information on controlled products, the Controlled Products Regulations and the Hazardous Products Act. Our team of OHS specialists will visit your establishment to conduct an extensive inventory of hazardous materials that are regulated by WHMIS 2015. Using our state-of-the-art technologies, this step is quick and puts you on the path to a sound management of your hazardous materials. Following the inventory, our specialists will provide a compilation of recommendations and nonconformities observed in your installations in order to identify the potential risks. The recommendations may include outdated products, storage methods or incompatibilities. 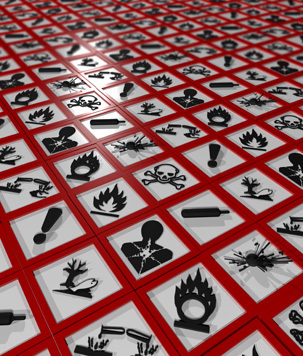 In the end, your safety data sheets will be made available via the Preventis application. For each manufacturer’s SDS a workplace preventive data sheet will be systematically created in both official languages to facilitate access to the information by your workers. Workplace labels will also be created to allow the identification of your products in conformity. Once all the information is added to the Preventis application, the implementation of the software will include the training of your employeesusers (production -procurement – managers…). Our applications are all designed with the end user in mind, which is why training is done quickly and with ease. Your employees will be able to navigate easily through the system to find the information they need in order to work safely. Once the system is up and running, we arrange continuous monitoring to ensure that SDS records, “Preventive data sheets” and labeling are all up to date and confirmed through our follow-up communications. UNLIMITED access to Preventis’ integrated management system for hazardous materials and wastes including but not limited to: Real-time approval and recommendations by our specialized staff whenever a new hazardous product is listed, management and consultation of all your SDS records, “Preventive data sheets” and workplace classification labels.